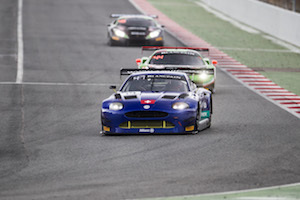 With an impressive race to catch-up, Norbert Siedler celebrated the eleventh place in his comeback with the Emil Frey Jaguar GT3 in Barcelona. 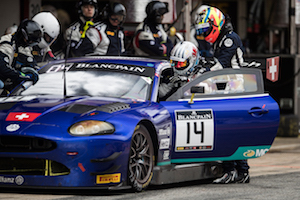 After a technical problem in qualifying, the Tyrolean and his team-mates Alex Fontana (CH) and Stéphane Ortelli had to start into the season final of the Blancpain GT Series from the 46th place. “This is a lot more than we had expected after qualifying,” Norbert Siedler was satisfied with the eleventh position. At the beginning of the qualifying, the track was still wet. Therefore, the lap-times became faster and faster and the fight for the starting positions was decided in the third part of the session. But before Norbert Siedler had finished his first timed lap, his car stopped beside the track with a technical problem. The Jaguar-trio had to settle with the 46th starting position. “Starting from the last row makes it very difficult. But the 14th position achieved by our sister car makes me confident. The pace would have been good,” Norbert Siedler analysed the qualifying. His optimism was justified: In the first two hours of the race, Stéphane Ortelli and Alex Fontana won many places and Siedler started the final stint in 17th position. Before the winter-break starts, two races of the VLN Endurance Championship are still on Norbert Siedler’s schedule. Already at the next weekend, the 34-year-old will share the Frikadelli-Porsche with his fellow-countryman Klaus Bachler (A). 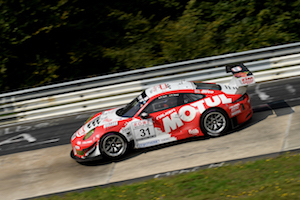 The season finale of the VLN will be held two weeks later on October 21.